Encircled by the buildings of the Castle complex, St Vitus Cathedral towers over them and is one of the most famous landmarks in Prague. It is also both the largest church in Prague and the largest cathedral in the Czech Republic. The site of the cathedral stands on the site of a sacrificial altar to the heathen fertility god Svantovit, which partly helps explain why the original church, founded in 929 by Prince Václav, was dedicated to St Vitus. The cathedral was only finished in 1929, exactly 1000 years after the first church was established. Establishing a medieval cathedral was the idea of Emperor Charles IV (1346-78), who at the time was merely heir to the throne. He created a separate archbishopric in Prague and brought the relics of St Wenceslas to the church. Charles originally commissioned Frenchman Matthias of Arras to start work on the cathedral, which was to be similar to Narbonne Cathedral in France, but Matthias died in 1352, eight years after work started. The emperor then asked mason Petr Parléř, who was just 23, to continue the work. Parléř worked on the cathedral and other buildings in the city, but when he died, in 1399, only the choir and south transept had been completed. Over the following centuries, St Vitus Cathedral remained unfinished, and engravings from those periods depict the cathedral without a nave. 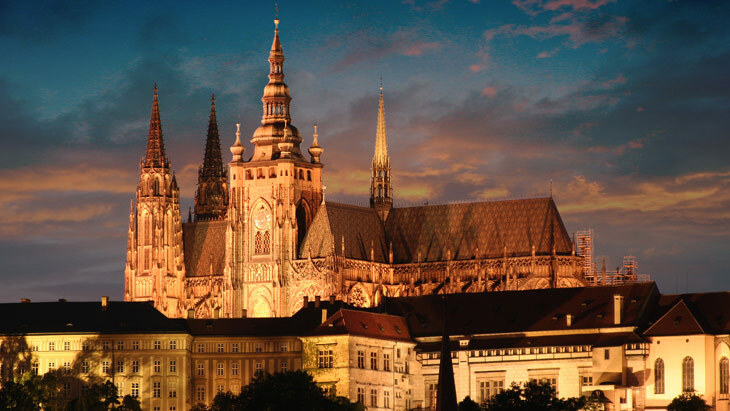 The Czech National Revival in the nineteenth century prompted calls for the cathedral to be finished: a complete cathedral was seen as a symbol of Czech nationhood. Many architects, principally Josef Mocker and Kamil Hilbert, were involved in the construction of the nave, and artists and sculptors designed the furnishings and stained glass. An official opening ceremony was held in 1929. Pollution has blackened the entire cathedral, but if you look closely at the stonework you will notice that the west front, including the twin spires, and nave are more recent than the rest of the building, which mainly dates from the medieval period. The most obvious contrast is the main tower (Hlavní věž), above the south door: the tower is Gothic, the lighter coloured parapet Renaissance, and the cupola, designed by Nicolo Pacassi, is Baroque. Directly underneath the tower is South Door, known in Czech as the Zlatá brána, designed by Parléř in the fortheenth century and featuring a mosaic of The Last Judgement. Angels can be seeing pulling the dead from tombstones, while the wicked are dragged off to hell. Today, the mosaic more closely resembles its original glittering appearance, the result of restoration carried out a few years ago. Visitors enter through a doorway in the soaring Neo-Gothic West Front, which features a sculpture of Mocker and Hilbert below the rose window. Once inside, visitors are struck by the impressive height of the vaulting, and an abundance of light floods in through the clear-glass windows of the clerestory. They contrast the colourful stained glass windows in the aisles, including those by František Kysela, which look as if they are made from many tiny pieces. To the right of the nave and beside the South Door is one of the most important parts of the cathedral, the Chapel of St Wenceslas, the country’s patron saint, who was killed by his pagan brother Boleslav the Cruel in 929. Boleslav repented 10 years later and had Wenceslas’ remains brought here, and Emperor Charles IV commissioned Petr Parléř to build the chapel on the site. Inside, the dazzling chapel is richly decorated with 1372 semi-precious stones from Bohemia, symbolising the New Jerusalem from the Book of Revelation in the Bible, and fourteenth-century frescoes. The chapel is also famous as the place where the Bohemia crown jewels are kept. A door in the south wall leads to a coronation chamber, which is very rarely open to the public. The jewels include the gold crown of St Wenceslas, which contains some of the largest sapphires in the world. The chamber is secured by seven locks, secured by seven keys, kept by seven people, including the Czech president. The high security is partly to prevent anyone trying on the crown – which would be fatal, according to legend. During World War II Reichsproktektor did so and was assassinated soon after. The eastern half of the cathedral dates from the Middle Ages and consists of the choir, which ends in a series of chapels grouped around the semi-circular ambulatory. The remains of a number of early Czech rulers are contained in the chapels, including Přemsyl Otakar I and II and Emperor Rudolf II. In the middle of the ambulatory is the flamboyant, solid silver casket containing the remains of St John Nepomuk. The martyr was thrown off Charles Bridge in 1393 on the orders of King Václav IV, for apparently refusing to reveal details of the queen’s confession. An entrance off the ambulatory leads to the Royal Crypt (Královská hrobka), where a number of Czech kings and queens are buried, including Rudolf II, and George of Poděbrady (Jiří z Poděbrad), who is buried in a modern sarcophagus dating from the 1930s.